Hummer's 2009 European sales declined 55% to 560 units compared with 2008. DETROIT -- General Motors Co. will wind down its Hummer brand after a proposed sale to China's Sichuan Tengzhong Heavy Industrial Machines Co. Ltd. fell through. Tengzhong “was unable to complete the acquisition,” GM said Wednesday in a statement. The Chinese company failed to win government approval of the sale, a source familiar with the negotiations said. GM said it will honor warranties, provide spare parts and will support service for Hummers worldwide. Hummer sold 560 units of its boxy, rugged-looking SUVs in Europe last year, down from 1,246 in 2008, according to market researcher JATO Dynamics. The collapsed Hummer deal came the day after GM completed the sale of Saab to Dutch niche carmaker Spyker Cars NV. GM is open to receiving other bids for Hummer during the wind down, the source said. The deal that saved Saab arose out of a similar situation: Spyker entered a bid after a proposed sale of Saab to Sweden's Koenigsegg Group AB fell through in November. The chances of resurrecting Hummer are viewed as slimmer than they were at Saab, the source said. GM put Hummer up for sale in 2008, before the global financial crisis that dragged the automaker into bankruptcy last year. In June of last year, GM said it expected to sell Hummer to the Chinese heavy machinery maker, which has no experience in the auto industry. 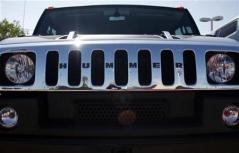 Hummer's 67 percent U.S. sales decline last year was the steepest of any volume brand. GM bought Hummer in December 1999 from AM General, which has continued to make versions for the armed forces. Hummer entered the civilian market in 1992. Non-government Hummer sales were averaging between 800 and 1,000 units annually when GM bought the brand. Hummer's U.S. sales peaked at 71,524 in 2006, before demand was choked by gasoline prices that soared above $4 per gallon in 2008. Sales last year dwindled to 9,046. The failed deal means Hummer will likely join two other U.S. brands that are shutting down. GM is closing Saturn after a planned sale fell through in September. Pontiac is also being phased out.